Vancouver, 02, Canada - 1 person likes this. As many dog owners can attest, bringing a faithful canine companion along on a hike or camping trip can be a fulfilling endeavour for human and pooch alike. But what about backpacking with cats? As many dog owners can attest, bringing a faithful canine companion along on a hike or camping trip can be a fulfilling endeavour for human and pooch alike. But what about backpacking with cats? It might seem impossible, but British Columbia's Bolt and Keel, adventure cats — make it look like a walk in the park. 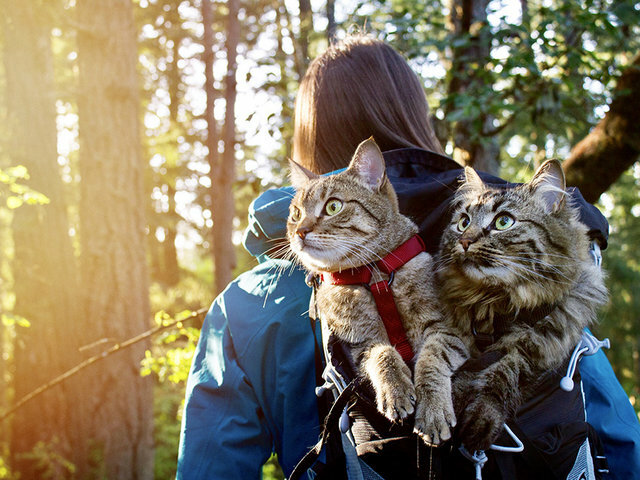 G Adventures spoke with Kayleen VanderRee, one of the adventurous felines' owners (Danielle Gumbley is the other) on the challenges and rewards of taking two curious cats into the great outdoors. Q When did you first meet Bolt and Keel? A Danielle and I worked together two summers ago, leading an outdoor summer camp. We found Bolt and Keel behind a garbage can in a bush in a local park. The plan was to take them to the local shelter, but it was closed by the time we got there. The following day, we were scheduled to depart on a multi-day backpacking and canoeing trip into Strathcona Park (British Columbia). Since the kittens still were with us, we decided to bring them along, and take them to the shelter when we were back from our trip. Bolt and Keel proved to be intrepid explorers, and by the end of the weekend, we knew that we wouldn’t bringing them to the shelter. Danielle and I are both animal lovers, but we always seem to put adventuring first. Most weekends we are out exploring the great outdoors so we’ve never had time or the ability to fit an animal into our lifestyles. After Bolt and Keel’s first weekend adventuring with us, we knew that we could have the best of both worlds: Adventure cats! For their first trip we stopped at the pet store to pick up harnesses with leashes, a few cans of wet food and some salmon treats. 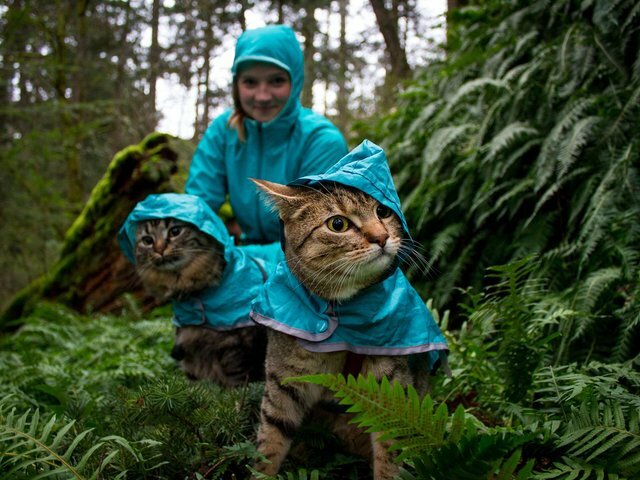 We slept with them in our sleeping bags and introduced them to the great outdoors as their litter box. Q: How did the two react to travelling in the wild with you the first time? A: Bolt and Keel spent most of their first trip taking in the sights around them from the safety of our jackets. It rained a lot, and tucking them against ourselves allowed them to stay dry and happy. When the rain finally stopped, Keel enjoyed hiking, and trotted along at our heels. Even on day one, Bolt proved to be the lazier one, so we slung him around our necks. Since that first trip, we have purchased them small dog life jackets for when they’re out on the water and have tried several types of harnesses to find the best fit. We have decided to always keep Bolt and Keel on harness when they are in the wilderness so we have control in case anything unexpected comes around the corner. Loud noises and exuberant dogs are handled better when the cats are in the safety of our arms. Understanding body language is important when adventuring with cats. We do our best to anticipate what the cats need before they become uncomfortable, and we aren’t afraid to turn around early if needed. We have learnt that Bolt and Keel are much more comfortable in remote locations; they can get quite anxious around car traffic or when they constantly hear the voices of other hikers. Luckily, Vancouver Island and British Columbia have an abundant amount of wild spaces for us to explore. Q: Each cat has favourite activities. How can you tell what these are? A: Keel is definitely the hiker and rarely lets anyone hold him for more than a minute or two. When he is in his element, his tail will be up, and he can keep a decent pace on the trail. Bolt is more comfortable out on the water, whether canoeing on a lake or kayaking on the ocean. He prefers to have his face in the wind and watch the world go by. Q: What are some specific veterinary precautions you have to take? Is it basically just like having an outdoor cat? A: Our vets know about Bolt and Keel’s unique lifestyle and have given us the same advice as they would an outdoor cat. Q: Can you tell me a story about a time when you were surprised, amazed or maybe even scared by an encounter or experience you had with Bolt and Keel in the wild? A: One weekend in the winter, we found ourselves up before the sun to hike up to the base of Triple Peak Mountain. The hike up follows a waterfall, which Bolt and Keel scrambled up with no problem. A suggested hour and a half hike (human time) turned into three hours (cat time), so by the time we made it to the top we didn’t have much time to enjoy the view before turning around. We were amazed by Bolt and Keel’s abilities: they proved capable of bushwacking, navigating icy terrain, and clambering through snow. Q: You’re a great photographer. How do you know when’s the best time to snap a few shots of the pair? A: Thank you! I constantly have my camera on hand and try to get real shots of us in the moment. No one likes a camera in their face when they’re grumpy — and of course, we always aim to shoot at the golden hour. Q: If they could talk, what destinations do you think are on Bolt and Keel’s bucket lists? A: Bolt and Keel are game for most adventures, but the lakes of British Columbia are calling their names this year. Boya Lake in Northern British Columbia is next on our list!